The election is finally over and the holiday season is upon us. And that means nearly two months of holiday fun and cheer are coming your way. To help you navigate the season and keep your spirits bright, we present our select guide to holiday fun from Thanksgiving to Christmas. Winterblast Twelfth annual holiday art party takes over the South of A arts district in Santa Rosa. Open studios showcase dozens of artists in their element, an electric sofa parade lights up the streets, and live music from the Hubbub Club marching band kick the holiday spirit into gear. Magic, belly dancing, food trucks, beer and wine and merriment abound. Nov. 19. 312 South A St., Santa Rosa. 5–9:30pm. Free entry. sofasantarosa.com. Holidays in Carneros Nearly 20 wineries in the Carneros region of the Sonoma and Napa valleys will offer a variety of activities, including food and wine pairings, live music, art or craft shows and special tastings. Nov. 19–20. Various winery locations. 11am to 4pm. Contact the Carneros Winery Collective for info. 707.256.0693. Napa on Ice Napa's outdoor skating rink, located on the grounds of the Napa Expo, is back for another year of holiday fun. Recreational ice skating is open daily with lessons, parties, private ice time and special events. Nov. 19–Jan. 8. $13 general admission. napaonice.com. Napa Valley Wine Train Thanksgiving on the Napa Valley Wine Train is a traditional gourmet feast with all the fixings in a nontraditional but memorable setting. Nov. 24. Lunch, 10:30am–3pm; dinner, 4–8:30pm. $166 and up. 800.427.4124. Yountville 28th Annual Festival of Lights Skip the shopping malls and join the people of Yountville for a food and wine festival in the holiday spirit. Santa, his elves and local celebrities will all be there to transform the town into a magical winter wonderland with thousands of sparkling lights, live entertainment and carriage rides. Nov. 25. Yountville Community Center, 6516 Washington St., Yountville. 3–6pm. $30–$55; kids 12 and under are free. 707.944.0904. Healdsburg Downtown Holiday Party The chic stores downtown light up their windows with holiday lights and cheer. Live entertainment, caroling, horse-drawn carriage rides, pictures with Santa and merriment galore are all part of this annual small-town holiday tradition. Nov. 25. Healdsburg Plaza. 4–8pm. Free. 707.433.6935. Parade of Lights & Winter Wonderland Thirty-seventh annual event in the heart of Marin features a grand parade and tree-lighting ceremony, with snow sledding, kids' activities, a holiday market and more. Festive window displays light up the scene while live music and holiday entertainment packs in the families. Nov. 25. Fourth and A streets, downtown San Rafael. Event begins at noon; parade begins at 5:30pm. sresproductions.com/events. Heart of Sonoma Valley Holiday Open House Toast the holiday season on a tour of 19 wineries throughout the heart of Sonoma Valley. Includes access to wineries and winemakers, holiday gifts and wine country holiday cheer. Nov. 25–26. 11am–4pm. $55 per person; designated driver, $15. heartofsonomavalley.com. Santa's Riverboat Arrival Santa and Mrs. Claus give the season its start when they arrive by tugboat at the Petaluma River Turning Basin. After disembarking, they'll hand out candy and take holiday photos with kids while live entertainment entertains the crowd. Nov. 26. River Plaza Shopping Center, 72 E. Washington St., Petaluma. 11am to 2pm. Free. 707.769.0429. Napa's Christmas Parade This 54th annual family-friendly evening parade features creative floats built by Napans themselves, focusing on the theme "Bright Lights, Christmas Delights." Nov. 26. Second and Third streets in downtown Napa. 5–7pm. Free. Holiday Tea Service Hotel Healdsburg hosts its fifth annual weekend tea services to provide a relaxing atmosphere in the midst of all the holiday madness. Enjoy custom teas, pastries, petite sandwiches and even classic cocktails, should you desire. Festive piano music and décor add to the ambiance. Nov. 26– Dec. 18. 25 Matheson St., Healdsburg. Saturdays and Sundays, 2–4pm. 707.431.2800. Sausalito Gingerbread House Tour & Competition Tenth annual city-wide event features more than 30 business and merchants participating in creating festive and delicious gingerbread houses. Most are on display in walking distance of each other, meaning that this is a family-friendly diversion from the hustle and bustle of holiday shopping. Dec. 1–30. Downtown Sausalito. Maps are available at participating merchants or at sausalitogingerbread.com. Windsor Holiday Celebration on the Green Open the holiday season and bring the kids to send letters to Santa, make crafts, decorate gingerbread and ride the Polar Express before the annual tree-lighting ceremony. Dec. 1. Windsor Town Green, 701 McClelland Drive, Windsor. 5–8pm. Free admission; $1–$8 for various activities. 707.838.1260. Light Up a Life Heartland Hospice honors lives lost with annual candle- and tree-lighting ceremonies. Celebrate the holidays with community, enjoy live music and create an ornament in honor of your loved one. Dec. 1. Memorial Hospice, 439 College Ave., Santa Rosa. 6–7pm. Free. hospicelightupalife.org. ICB's Winter Open Studios More than a hundred painters, sculptors, fabric artists, jewelers, photographers and other artists open their doors for this 48th annual event to let you discover new and unique works of art where they are created. 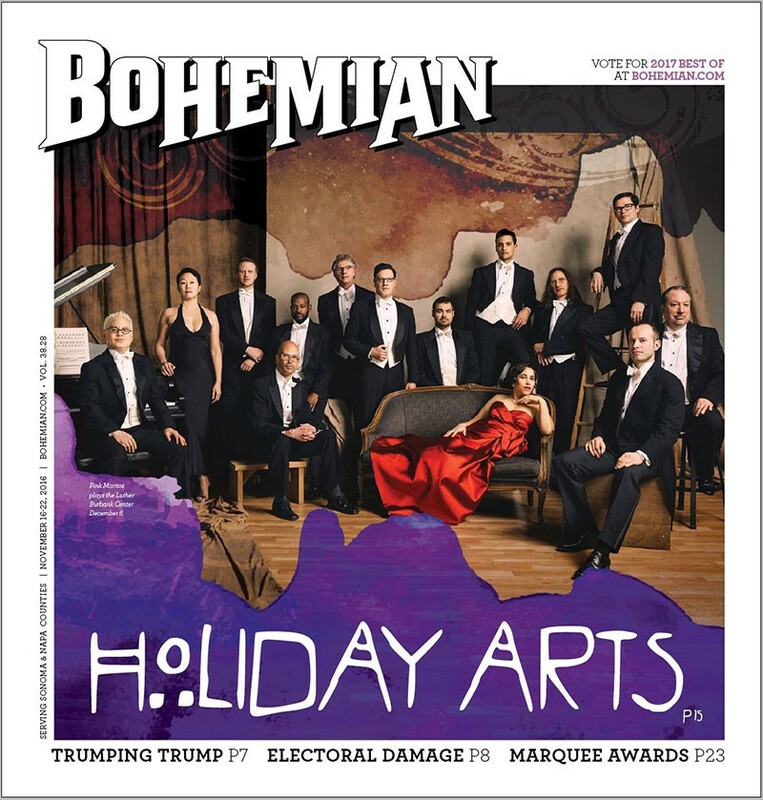 Dec. 2–4. Industrial Center Building, 480 Gate Five Road, Sausalito. 11am–6pm. Free admission and parking. icb-artists.com. 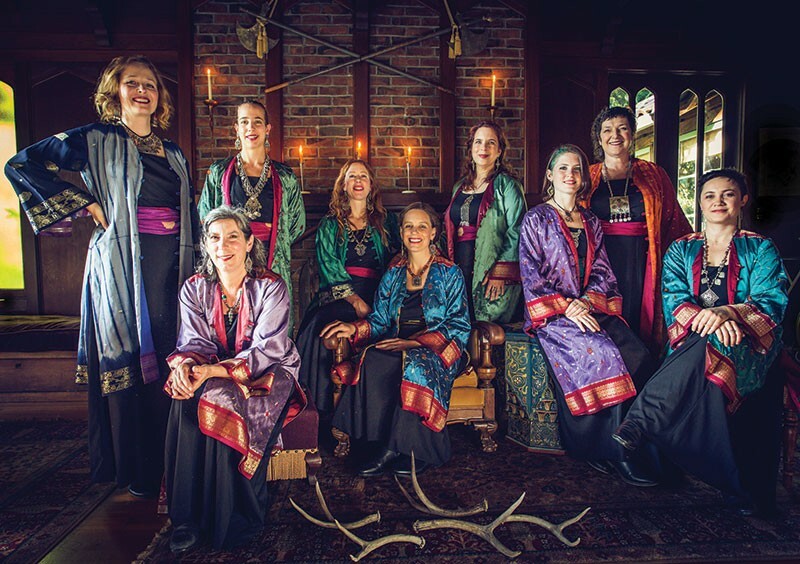 WINTER SONGS Women’s vocal ensemble Kitka perform their popular holiday program of Eastern European–inspired music on Dec. 10 in San Rafael. Lighting of the Snowmen Annual tradition lights up Cornerstone Sonoma with decorative snowmen coming to life amid live music and entertainment. Get a photo with Santa and enjoy the seasonal spirit in the picturesque setting. Dec. 3. Cornerstone Sonoma, 23667 Hwy. 121, Sonoma. 4pm. Free admission. 707.939.3010. Bacchus Holiday Bazaar Gun Bun winery offers a holiday fair for the cool kids, with holiday gifts offered in a market setting inside the historic redwood barn. DJs spin seasonal hits, food trucks offer bites to nosh on and an annual toy drive lets you contribute to the festive spirit. Dec. 3. Gundlach Bundschu Winery, 2000 Denmark St., Sonoma. 11am–4pm. 707.938.5277. Napa B&B Holiday Tour & Taste Event The bed and breakfasts of Napa invite you inside their historical inns, decked out in festive decorations, to savor select wines and tasty holiday treats. Transportation and entertainment included. Proceeds benefit local charities. Dec. 3. 3–7pm. $75. napaholidaytour.com. Calistoga Lighted Tractor Parade Twenty-first annual small-town celebration of the holiday season and Calistoga's agricultural heritage boasts vintage tractors, antique trucks and other rustic autos lit up in dazzling displays in this perfect family event. Dec. 3. Lincoln Avenue between Cedar and Stevenson, downtown Calistoga. 7pm. Free. visitcalistoga.com. Wine Country Winter Festival Inaugural event from the folks behind the Bodega Seafood, Art & Wine Festival is a massive celebration of arts, crafts, food, wine and entertainment. Three stages of music feature local favorites like David Luning, Frobeck, Bootleg Honeys, Lost Dog Found and many others. An extensive selection of microbrews, ciders and wines will be on hand for tasting. A gingerbread competition and other family-friendly activities will keep the kids busy, and a pavilion of arts and crafts allows you to get beautiful gifts for all tastes. Dec. 3–4. Sonoma County Fairgrounds, 1350 Bennett Valley Road, Santa Rosa. Saturday, 10am–6pm; Sunday, 10am–5pm. $12–$15; kids 12 and under are free. 707.824.8717. Luther Burbank Holiday Open House A popular holiday tradition in its 37th year, this open house features Victorian-era finery and a charming tour of Burbank's historic home and gardens, with free parking at First and D streets and free rides on Rosie the Trolley to and from the Handmade Holiday Crafts Fair held at the Finley Community Center. Dec. 3–4. Luther Burbank Home & Gardens, 204 Santa Rosa Ave., Santa Rosa. 10am to 4pm. $3; kids 12 and under are free. 707.524.5445. Calistoga Winter in the Wineries Seventh annual winter event lets you purchase a passport to visit wineries and meet the winemakers in and around the Calistoga area in relaxed tasting tours that you schedule at your convenience. Dec. 3–Feb. 5. $50. visitcalistoga.com. Mill Valley Winterfest Annual family-friendly holiday tradition returns with snow sledding, live music, local food and tree-lighting ceremony. Dec. 4. Mill Valley Depot Plaza, 87 Throckmorton Ave., Mill Valley. 11am–5pm. enjoymillvalley.com. Guerneville Holiday Book & Bake Sale Find something great to read this holiday season when River Friends of the Library hosts its annual homemade baked goods sale and used book drive. Dec. 7–10. Guerneville Library, 14107 Armstrong Woods Road, Guerneville. Wednesday, 4pm–7; Thursday–Friday, 10am–5pm; Saturday, 10am–3pm. riverfriendsofthelibrary.org. Sebastopol Holiday Home Tour & Artisan Boutique Enjoy the holiday lights and décor of several different stylish homes, with cheerful music and festive bites on hand. Then browse a variety of holiday crafts and decorations for sale at a boutique at Pleasant Hill Christian School, all benefiting the school's scholarship program, the Jacob's Fund. Dec. 9–11. 1782 Pleasant Hill Road, Sebastopol. sebastopolholidayhometour.com. Artisan Craft Faire & Holiday Festival Over 60 local vendors offer their handmade holiday arts and crafts, perfect for gift-giving, with live entertainemnt, delicious food, Santa Claus and children's activities on hand. Dec. 10. Center for Spiritual Living, 2075 Occidental Road, Santa Rosa. 10am–4pm. 707.546.4543.